With the downfall of ITT Tech and the decision by the Education Department to revoke federal support for the Accrediting Council for Independent Colleges and Schools, a major accreditor for for-profit colleges, the future of for-profit education is in question. At issue: For-profit colleges are heavily reliant on federal loans and their tuition rates are typically above their public education counterparts. This leaves many questioning how much value they provide to their students for the cost. To better understand this dynamic, we charted the federal loan rate by institution against the tuition rate from the same 2013-2014 school year. 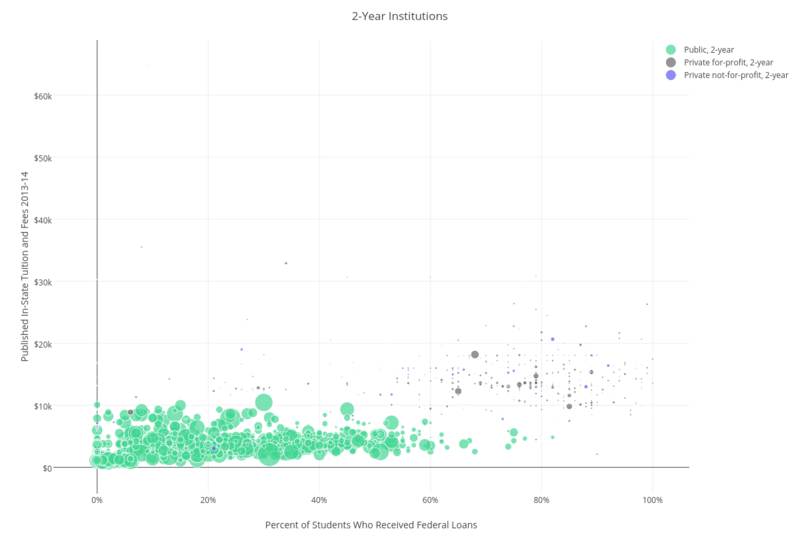 These visualizations compare the percentage of students that received federal loans at a given institution to tuition rates from the 2013-14 school year. The three separate visualizations showcase the variations between two-year and four-year institutions, as well as public, private for-profit, and private not-for profit institutions. 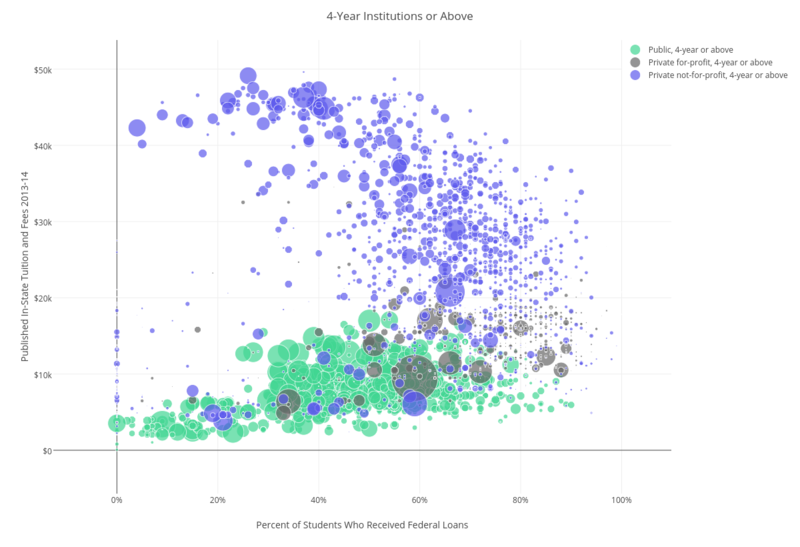 The varying bubble sizes represent the total enrollment count at each institution. Students attending private, for-profit colleges (the gray circles) are highly dependent on federal assistance. These colleges tend to cost more than the typical public college (green), but less than the typical private, not-for-profit (blue). The bulk of the four-year public colleges see 40-60% of their students using federal loans. And these students are generally hovering just below the $10,000 per year tuition. Most students at the prestigious private not-for-profit college do not use federal loans. Public four-year colleges and community colleges that offer four-year degrees generally cost much less (below $20K per year) than their private for-profit and private not-for profit counterparts, have great per-institution enrollments, and receive a strong mix of federal funding. For instance, less than 20% of the students at the more community based institutions (those that offer two- and four-year options like the CUNY system, Miami-Dade College, and Columbia Basin College (Wash.)) receive federal assistance. This is the lower left-hand corner of the graphic. On the bottom right-hand corner are the public colleges and universities where more than 80% of the students are receiving federal financial aid. Here we see many of the historically black, land-grant universities like Grambling State, Albany State, Savannah State, Virginia State, Norfolk State, and Alabama A&M. Tuition at private, not-for-profit colleges and universities is highly variable. On the upper left-hand corner, we see intuitions like Harvard, Princeton, Yale, and Stanford. These are expensive schools with deep pockets; they don’t really use federal dollars much at all. After that you see a very interesting mix—some high-price schools don’t have a lot of students on federal loans, while others have a lot. Again, the green dots represent community and technical colleges and the gray, private, for-profit colleges. First, enrollment at two-year public colleges is far greater than at private colleges (most of these private colleges have fewer than 100 students). Second, students at community and technical colleges really don’t rely on federal loans like the students at the private colleges. Third, the public colleges are much cheaper. Almost all of them are below (many of them well below) $10,000 per year. Almost all of the two-year private colleges are above $10,000 per year. If you have additional thoughts or questions about this or would like to see additional analysis, make a comment or contact us (rob@economicmodeling.com).